Dogs come in all shapes and all sizes, but their food doesn’t have to. Multiple dogs and growing puppies can make mealtimes complicated. 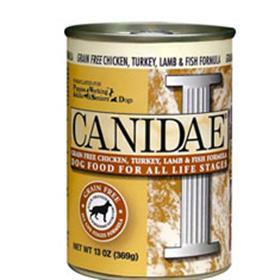 With this CANIDAE Life Stages All Life Stages formula mealtimes are easy — even for multiple dog households. High quality meats and fish, delicious flavor, and a scientifically formulated nutrient-rich recipe simmered in natural broth make this moist meal a great choice for every canine in your family. Ingredients: Chicken, Chicken Broth, Lamb, Chicken Liver, Ocean Whitefish, Brown Rice, Eggs, Guar Gum, Sunflower Oil (Source of Omega-6 Fatty Acids), Sun-cured Alfalfa Meal, Dicalcium Phosphate, Potassium Chloride, Flaxseed Oil (Source of Omega-3 Fatty Acids), Choline Chloride, Carrageenan, Salt, Kelp, Rosemary Extract, Cranberries, Lecithin, Yucca Schidigera Extract, Cassia Gum, Vitamins (Ascorbic Acid (Source of Vitamin C), Vitamin E Supplement, Vitamin B12 Supplement, Vitamin A Supplement, D-Calcium Pantothenate, Vitamin D3 Supplement, Niacin, Riboflavin Supplement, Biotin, Pyridoxine Hydrochloride, Folic Acid, Thiamine Mononitrate), Minerals (Zinc Amino Acid Chelate, Iron Amino Acid Chelate, Manganese Amino Acid Chelate, Copper Amino Acid Chelate, Sodium Selenite, Calcium Iodate).